It took months, but I finally finished and reviewed Metal Gear Solid V. It was a tough game to review, mostly because my dreams for an epic conclusion to the Metal Gear franchise seem to have been dashed by corporate stupidity forcing the game to be released before it was finished. 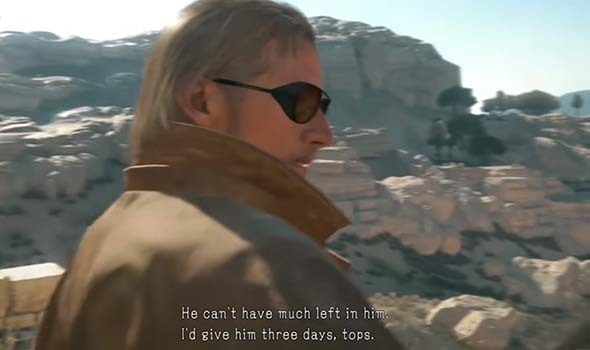 Maybe Kojima (and Konami) have some elaborate trick up their sleeve, and there's going to be some crazy patch that replaces the recycled missions in Chapter 2 with real missions, and which adds the missing third chapter and the "Kingdom of the Flies" mission. Unless that happens, I'm going to operate under the assumption that the recycled missions of chapter 2 were put in as placeholders for missions that were planned but never completed. And I have some ideas of what a couple of those missions might have been about. There's half of Foxhound from Metal Gear Solid 1, right there! After retrieving the microfilm in mission 38, you get a couple of intel tapes that might inform exactly what chapter two was supposed to be about. 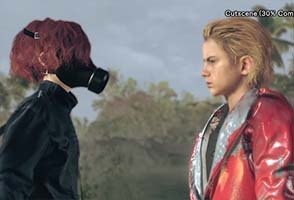 Informant's Report: Part 2 talks about the "Third Boy", who is a young Psycho Mantis. The first part of the tape reveals details on how Psycho Mantis' powers work. The second part is a bit more interesting, as it poses the conjecture that Eli was projecting his will onto the Third Boy, and controlling Sehalanthropous. This establishes how Eli (who would later be revealed to be Liquid Snake) begins his partnership with Psycho Mantis, the first recruit in his Foxhound team that would eventually take over Shadow Moses in the first Metal Gear Solid game. Was mission 40 supposed to be about Sniper Wolf? 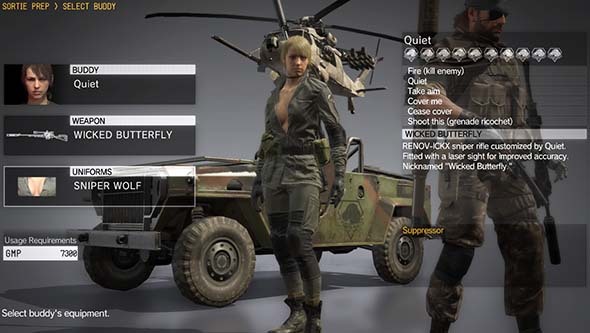 Obtaining Sniper Wolf's handerchief from the retread of "Cloaked In Silence" unlocks the Sniper Wolf costume. With that in mind, let's take another look at mission 40. It's a repeat of mission 11: "Cloaked In Silence". 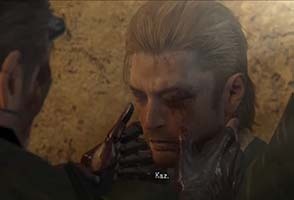 It's a repeat of the sniper battle with Quiet, complete with the same mission briefing and even repeating the cutscene of Quiet shooting down the pursuing plane on the way back to Mother Base. All the repeat missions in chapter 2 are reproduced verbatim from the original mission, right down to the bookending cutscenes (even though they make absolutely no narrative sense). But there's two interesting things about mission 40 that make it stand out. The first is that Quiet isn't wearing her regular bikini outfit. She's wearing a jumper - Sniper Wolf's jumper from Metal Gear Solid 1. She even has blonde hair. Secondly, completing the mission awards the player with a Handerchief item that allows Quiet to be equipped with the Sniper Wolf outfit. Is this a simple fan-service Easter Egg? Or was Mission 40 supposed to be a battle with a young Sniper Wolf that would establish how Eli [Liquid] and Sniper Wolf first met? Quiet even wears this uniform during the battle. Sniper Wolf was born in Iraq, and she grew up amongst military conflict, she moved around the Middle East and Africa frequently to avoid the authorities, and she was eventually rescued from that life by Big Boss. So her backstory is actually a near perfect match for an appearance in Phantom Pain! Maybe Iraq was supposed to be a third area of operations? 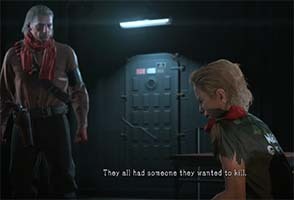 Mission 40 could have been intended to be a mission in which the player finds a young sniper wolf, engages her in battle to test her ability, and then captures and recruits her. Kojima may not have had time to finish this mission, and so Quiet's alternate outfit model was used instead, and Quiet's duel mission became a place-holder. I would expect that if a young Sniper Wolf had been planned, then Kojima would have already cast a voice and mo-cap artist. But as far as I know, nobody has found assets for any character model or dialogue from any one who could qualify as a young Sniper Wolf. IMDB does list some voice actresses for various soldier roles, but no young girls other than Paz's voice (from Tara Strong). But if the game is truly unfinished, and whole chapters hadn't even been developed yet, then it's possible that such casting simply hadn't happened yet. If early rumors of the mission list are true, then the game wasn't nearly as far along as we think. 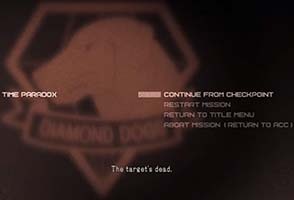 That mission list, by the way, has a mission late in the game called "Beauty of the Battlefield", which could be a prime candidate for the mission that would have introduced a young Sniper Wolf, and the fact that it takes place during a chapter called "The Cost of Revenge" could also be appropriate to Sniper Wolf's story. Though, this mission could also just have easily been a mission about Quiet. 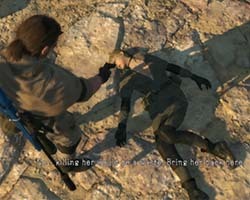 It is implied several times by behavior and dialogue that Quiet has romantic feelings for Snake.